four profiles were found for Chrono24.co.uk in social networks. Among other social networks the website is represented in Facebook, Twitter, GooglePlus and Pinterest. 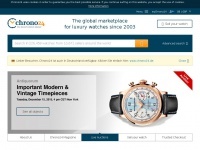 The web server used by Chrono24.co.uk is run by TelemaxX Telekommunikation GmbH and located in Germany. The server runs exclusively the website Chrono24.co.uk. A Apache server hosts the websites of Chrono24.co.uk. The website uses the latest markup standard HTML 5. Indexing the data of the website and following hyperlinks on it is explicitly allowed by robot information.